Sportsmans Pawn Shop Salt Lake City is one of the best ways to buy and sell guns legally in the country.We are federally registered firearms dealers and are required to comply with all federal gun regulations.This ensures that all guns bought and sold within the store are licensed, registered, and legal to both sell and own. 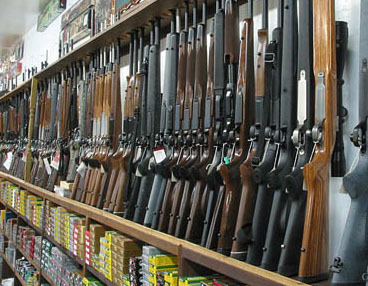 Just like a gun store we sell anything from pistols to hunting rifles.Guns are a high value item and can bring a high return from the pawn shop. Selling handguns to our pawn shop is also more reliable and safer than selling your gun to an unknown buyer on Craigslist or KSL.Our pawn shop have all the necessary forms and background checks available. Come see us if you are selling, buying, or pawning your gun. Getting a cash loan is quick and convenient! Come get cash today!!! When you come pawn your gun in our Pawn Shop in Utah, it is beneficial to go with an estimated value of your gun.The most valuable guns are those that are fairly new or antique quality old. There are several websites designed to help you establish the market value of your gun. PriceMyGun.com is a simple site organized by weapon type that is easy to find a starting price for your gun. Never walk into a Sportsmans Pawn Shop in Salt Lake City with a loaded weapon.Always bring it in a locked case, unloaded, with the magazine separate. It is always recommended to clean your gun first to ensure it is looking its best. Be sure to bring your ID, registration information, and any history you may have on the gun. It is important to note that pawn shops may conduct a background check and will not accept firearms from a minor or from anyone who is not a legal state resident. Workmanship, unique qualities, designer brands, and other characteristics may increase the resale value. Before coming into our pawn shop, gather as much information on the gun as you can. Include any family history, documentation, receipts, or other information to give an accurate representation of the quality of the weapon.It may be worth your time to visit a gun store in Utah to give you an appraisal estimate. Next, you must make a choice whether you'd like to pawn your gun or sell it outright. If you pawn your gun, you are agreeing to put the firearm up as collateral for a cash loan. Always make sure you understand the terms and conditions of the offer.Generally, a pawn loan gives you 30 days to pay back the loan and pick up your gun. If you can't pay back the loan,the shop keeps your gun. Whichever you choose, understanding the value of your gun is the best way to know how much you can expect to get and whether or not it's worth the sale. Guns are one of the few possessions that hold their value fairly well over time. Pistols, hunting rifles, and antique handguns are some of the most popular items bought and sold in pawn shops across the country. Doing your homework, coming prepared, and understanding the value of your item is the best way to ensure you get top dollar for your handgun. If you don't find what you're looking for in our Pawn Shop that doesn't mean that we don't have or accept it. Call us to check to see if we have a certain item or if we can accept your pawn item.